Need a quick and easy salad to brighten up your weekday lunches? 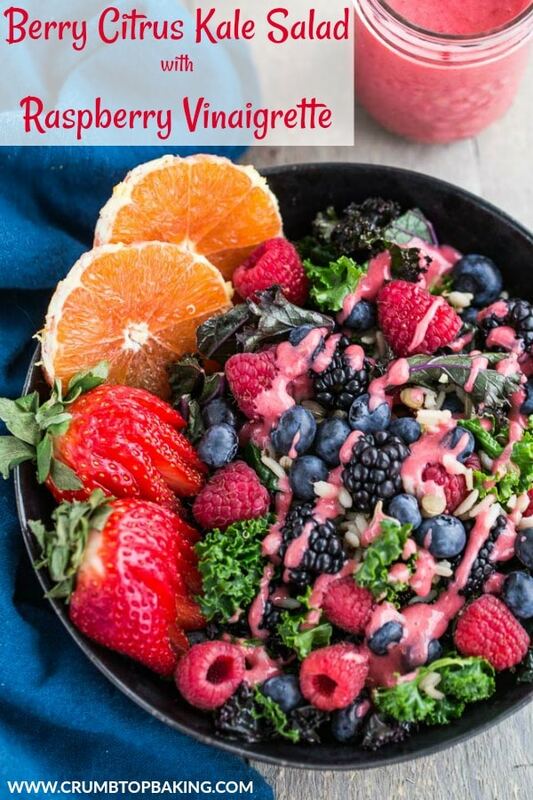 This Berry Citrus Kale Salad with Raspberry Vinaigrette is made with simple, clean eating ingredients and takes minutes to pull together! There are only a few days left in January, which means my clean and green challenge is coming to an end. If you’re a first time reader of the blog, you should know that I’m mostly into clean eating, but my New Year’s challenge was to incorporate green veggies and/or fruit into every meal during January. And to help with this challenge, every blog post throughout January featured a green fruit or veggie. I’m not going to lie. It was difficult sticking to this challenge for every meal. Lunch. Dinner. No problem. I love salads. And they were a go-to for many meals. But I knew breakfast would be a challenge. Toast with peanut butter and chia jam is my all-time favourite breakfast. It’s quick, easy and totally comforting. And there were a few mornings I woke up craving it. So I ate it! And that’s okay. Because this challenge was more about expanding my use of ‘green’ ingredients in the kitchen, not about restricting myself. As for lunch and supper, I really tried to think beyond my usual spinach or arugula salads. So I challenged myself to create different types of salads, with creative toppings and salad dressings. I also ventured into green soups, smoothies and snacks! Cilantro Jalapeño Edamame Hummus – a new favourite snack in our house! Winter Sunshine Salad with Honey Citrus Dressing – homemade salad dressings are clean, easy and my new favourite thing to make! Turkey Stuffed Collard Greens – almost like a cabbage roll, except clean eating and spicy! Spicy Sweet Green Pea Soup – what can I say? Sweet green peas and spinach. It doesn’t get any greener than this! 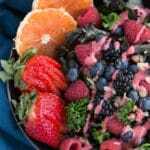 Given my new obsession with homemade salad dressings, it should come as no surprise that my final recipe for this clean and green January is a Berry Citrus Kale Salad with Raspberry Vinaigrette. 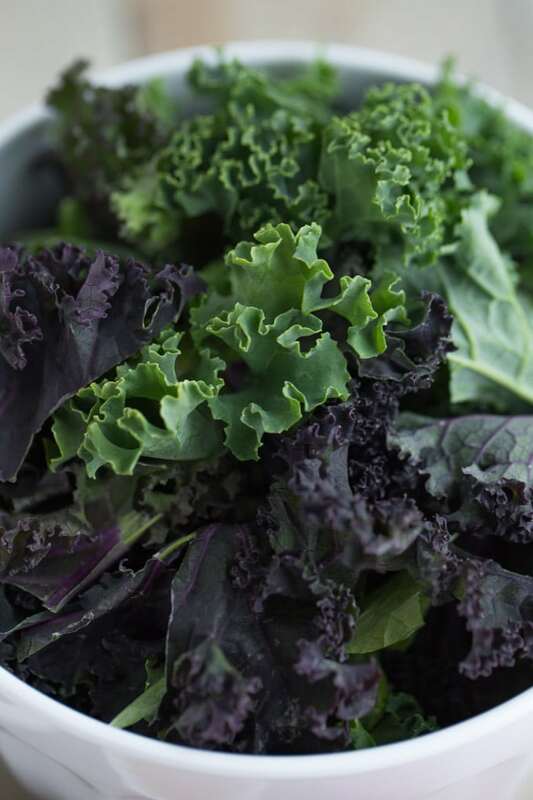 Kale – I used a blend of red, green and tuscan kale. Berries – blackberries, strawberries, blueberries, and of course, raspberries. Citrus – Cara Cara oranges are my favourite and they are in season now. Yay! Quinoa/brown rice – I actually used a brown rice blend with barley, green lentils and red quinoa. 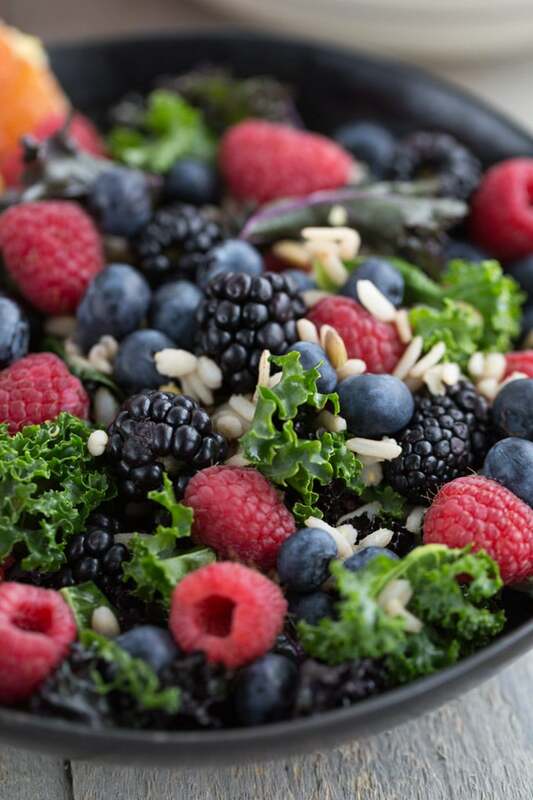 With all those ingredients, this Berry Citrus Kale Salad packs a bit of a nutritional punch. Antioxidants, vitamin C and fibre! Plus, the sweetness from the berries and the vinaigrette makes this salad taste more like a sweet treat than a healthy lunch! If you like this salad, please feel free to share! In addition to Instagram, Facebook and Pinterest, Crumb Top Baking is now on Twitter! 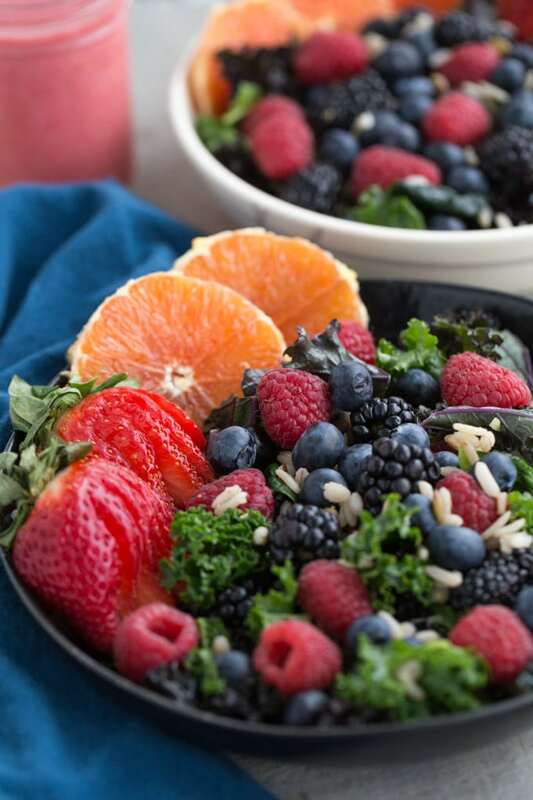 Berry Citrus Kale Salad with Raspberry Vinaigrette pulls together simple, clean eating ingredients like kale, blueberries, blackberries, strawberries, raspberries and oranges. It’s a great way to get in some antioxidants, vitamin C and fibre, so load up on this goodness for your weekday lunches! Add all the ingredients to a blender and blend on high until the mixture is smooth and creamy. Pour into a dish or mason jar for storing and serving. Makes about 3/4 cup. Store any leftovers in the fridge and use within 2-3 days. Add the kale to a large bowl. Cut the orange in half. Reserve half for slices to add to the salad. Squeeze the juice from the other half of the orange into a small dish and stir in the oil. Pour over the kale and massage the leaves for a few minutes. 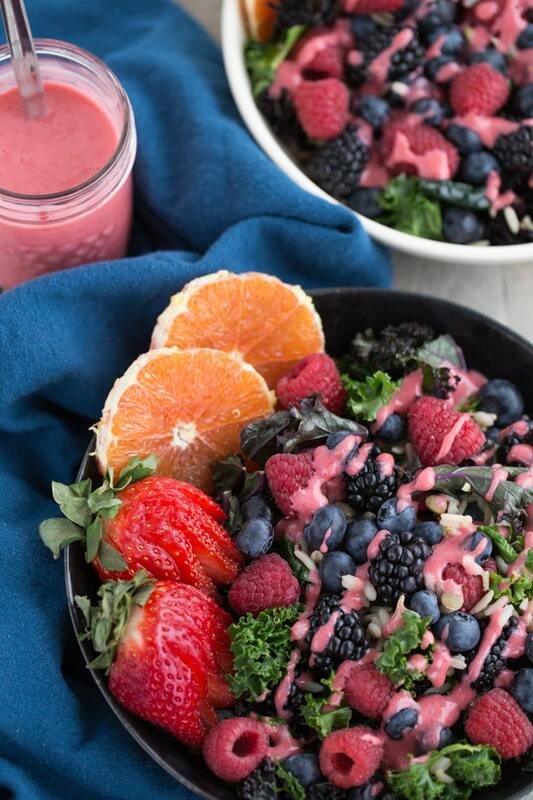 Divide the kale into 2 bowls, and top with the quinoa or brown rice, raspberries, blackberries, blueberries, strawberries and orange slices. Drizzle on the dressing. Store any leftovers in an airtight container in the fridge and enjoy within 1-2 days. If you’re making this salad in advance, I would wait to add the vinaigrette until just before serving. For the quinoa or brown rice, I used a brown rice blend with barley, green lentils and red quinoa. I love salads too and I think the only thing that could make me love them more is a beautiful pink salad dressing to drizzle over the top :). This looks SO DANG GOOD, Leanne! 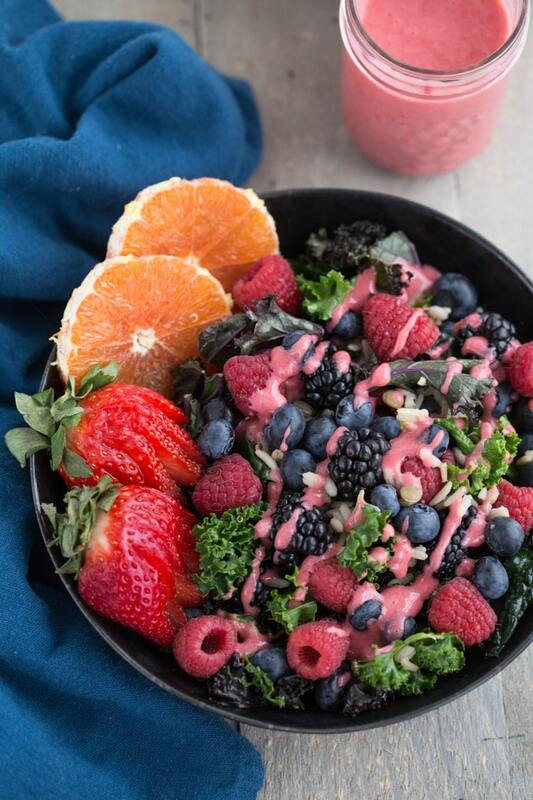 You can’t go wrong with berries and kale! Thanks!! You’re so right Kelsie. Berries and kale are such a great combo! And I’ve been adding this salad dressing to all my salads lately! I love a good salad, in fact I have one everyday for lunch! This one is special and so is that dressing. I love those berries! Pinned. Take care. I eat a lot of salads too! This one is definitely a change from my usual mix, but I’m loving all the berries these days. Reminds me of summer! Enjoy the rest of your week Stacey! Your body must be so grateful for all the greens you’ve been incorporating!! I love salad (a lot) and I am a bit of a berry addict. I think this looks incredible Leanne!! Thanks Katherine! Definitely glad I stuck with the challenge (for the most part!). It definitely forced me to think outside the box in terms of adding ‘greens’ to meals! Salads will always be my go-to!! Thanks Ashika! The raspberry vinaigrette is great with this salad! I can live on salads, especially of they look this good! This is almost too pretty to eat, but you know that’s not gonna happen, lol. Cara cara oranges are my absolute favourite! Love how easy they are to peel and how juicy they are. And that dressing sounds like the perfect pairing with this salad. Love it! Never thought about how easy it is to make your own vinegarette! Looks delicious! Thanks Cortney! Homemade vinaigrette is super easy and uses minimal ingredients. Once you start making your own, you won’t want to buy it again! i love putting fruit in my salads!! it feels like such a treat (; i’m that person who gets the salad from chickfila because i like the granola and fruit that they put in. 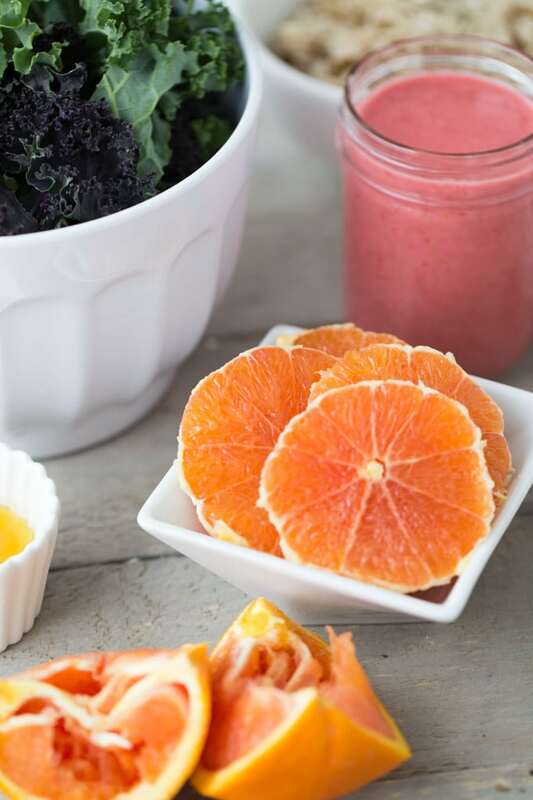 Love the citrus and delicious dressing idea! Thanks Helene! Can’t beat homemade salad dressings!! Thanks Neha! All the berries definitely give this salad some colour. It’s brightened up my lunches all week! This salad is just sooo pretty and I love the gorgeous pink dressing! I love the sound of your challenge and it sounded like you did a good job sticking to it! I love peanut butter toast with banana or jam for breakfast a lot too, so greens at breakfast would be hard sometimes! This salad is SO pretty and is making me miss berry season. This salad makes clean eating easy! Thanks Marcie! This salad definitely made clean eating easy for me this week! And I’m with you. I totally miss berry season too. Looking forward to the return of locally grown berries this summer! Thanks Jaclyn! I’m definitely not interested in food restrictions. It’s all about balance for me! I’m really enjoying kale salads lately, and this vinaigrette has been going on all of them! I hope you get a chance to try it. If you do, be sure to let me know what you think. Thanks Stefanija! You will love berries with kale! It’s a great combo! And the raspberry dressing pairs really well with all the berries. Be sure to let me know if you try it! Your salad looks too pretty to eat!! 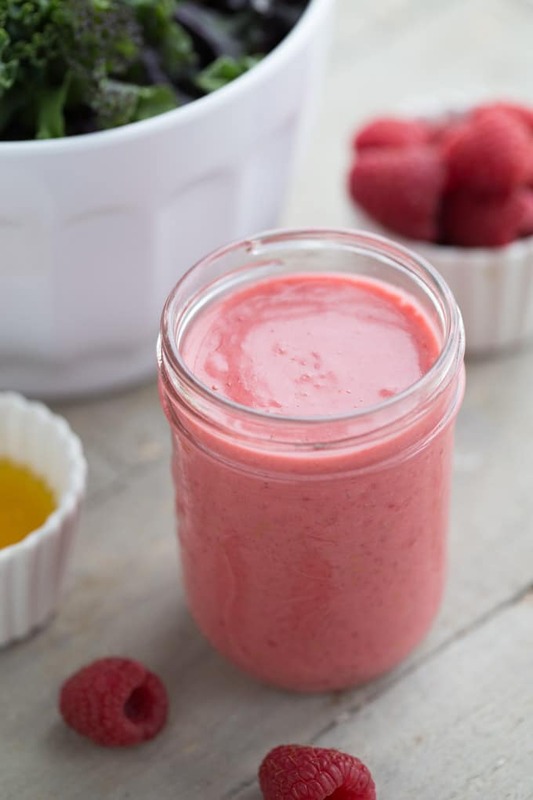 I love that sweet, pink raspberry maple dressing! I could eat salad for lunch everyday, if only it looked so beautiful! Thanks Deepika! You’re too sweet! This salad and the dressing are so easy to whip up. Perfect for weekday lunches! Oooo Leanne your Berry Citrus Kale Salad is so lovely! And sounds so tasty, especially with that Raspberry Vinaigrette! Great recipe and photos, I wish I could have a big bowl of this salad for lunch tomorrow!! Thanks Alia! You’re too sweet! This salad has been on repeat in my house for weeks. And I’ve lost count of how many batches of the vinaigrette I’ve made. Have a great week! This dressing looks amazing! Can’t wait to try it. Thanks Heidi! I love homemade dressings. Hope you get a chance to make it!